Russ and Cindy recently purchased a beautiful ocean view lot and are very excited about beginning the design process for their new home in Costa Rica. Russ is a civil engineer, and president of an engineering company in the San Francisco Bay Area. Cindy is a nurse, and the Stroke Program Coordinator for John Muir Health. 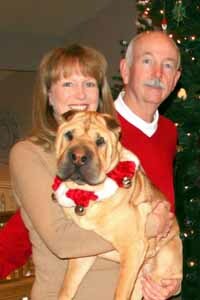 Mazu is their beloved Chinese Shar-Pei, who watches over the house and Sugar the cat when they are at work. They are all looking forward to retirement from their jobs in the near future, and to making Costa Rica their home base for adventures in Central and South America. Travel, golf, good wine and good food are high on the list of priorities for the Millers. "We are looking forward to trying all of the 40+ restaurants in the area. We may have to make some adjustments, like shifting our emphasis from California wines to South American wines. And finding golf courses may be more of a challenge, but with a new golf club being built in the area and easier road access to other areas in Costa Rica, we think we will be able to survive. In any event, there will be plenty to do exploring Costa Rica and all of it's natural wonders. We couldn't be more excited."